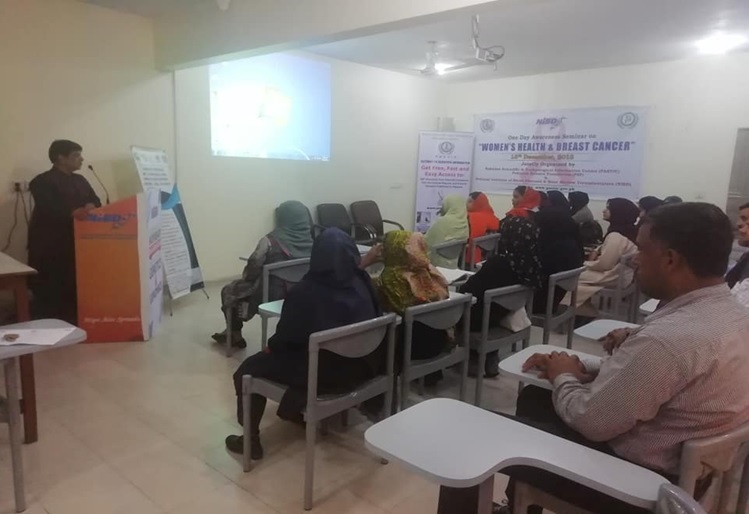 Seminar on "Women's Health & Breast Cancer"
PASTIC Sub Centre Karachi organized a one day Awareness Seminar on "Women's Health & Breast Cancer" on December 13, 2018 at National Institute of Blood Disease & Bone Marrow Transplantation, jointly organized by PASTIC/ Pakistan Science Foundation & National Institute of Blood Disease & Bone Marrow Transplantation. 38 Participants from National Institute of Blood Disease & Bone Marrow Transplantation, University of Karachi, Hamdard University etc., attended the Seminar. Dr. Muneera Borhani Associate professor /Consultant Hematologist, Resource Person from National Institute of Blood Disease & Bone Marrow Transplantation gave presentation on Breast Cancer. In the closing session, Dr. Sadaf Shahab, Associate Professor, Focal Person from National Institute of Blood Disease & Bone Marrow Transplantation was the Chief Guest of the Seminar. Deputy Director PASTIC Sub Centre Karachi gave presentation during One day Awareness Seminar on "Women's Health & Breast Cancer"